Telegram/ Канал ЛучковаA Google Pixel 3 — but not the exact pre-released device in question. Lai said he bought the device from an electronics shop in Hong Kong for $US2,030. 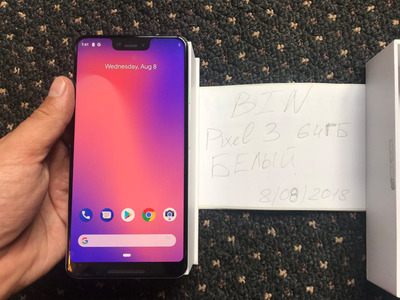 Engadget reporter Richard Lai has gotten his hands on what appears to be a Google Pixel 3 XL three days ahead of the device’s official release. In a video for Engadget, Lai said that he acquired the widely anticipated smartphone from a Hong Kong electronics shop called WahPhone Digital for $US2,030. According to Lai, the device seems to be the real deal, with features matching leaked information on the phone, including a rear fingerprint reader and a large upper notch. “[It] feels solid and well-built,” Lai wrote. It’s still not clear how WahPhone Digital acquired the Pixel 3 XL’s days before its official release date. Take a look at Engadget’s full review here.